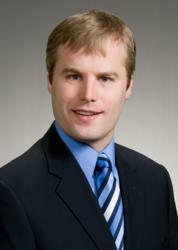 Schramm is a patent attorney with a background in electrical engineering. He has worked as a patent agent, and is particularly experienced in many technological fields. Holland & Hart LLP is pleased to welcome Paul Schramm to its Intellectual Property Group. Schramm is a patent attorney based out of the firm’s Boulder office. With a background as an electrical engineer, Schramm has experience drafting and prosecuting patent applications in various technological fields, and is particularly familiar with electronics, computer systems, complex telecommunications, software, and networking. Prior to joining Holland & Hart, Schramm worked for many years as a licensed patent agent. He is a member of Intellectual Property Section of the Colorado Bar Association and the Electronic and Computer Law Committee of the American Intellectual Property Law Association, and is licensed to practice law in Colorado and before the U.S. Patent and Trademark Office. Schramm received his J.D. from the University of Denver, and his B.S. from Brigham Young University. Holland & Hart LLP delivers integrated legal solutions to regional, national and international clients of all sizes. Since its inception in 1947, Holland & Hart’s more than 400 lawyers have consistently been recognized by leading national and international peer and industry review organizations for innovation and dedication to the practice of law.